If you hadn't noticed already, these denim shorts were a staple in my suitcase for Australia. I think I wore them almost daily and am SO glad I packed them. They worked perfectly for the vast array of climates and weather we experienced. I wore them at all of our tropical destinations over my bathing suits and with tank tops and I also wore them with sweaters and long sleeves as we headed South towards Sydney (this was weird for me but it's colder in the southern parts of Australia). They are such a great piece to have in your closet right now because we are experiencing the same thing here in the States. Fall weather can be all over the place and in my opinion, denim shorts are a must. I literally searched high and low to find the perfect pair before my trip and these were the winners. They are not too short (actually a little longer in the bum area), have a loose fit and a small amount of distressing. I wanted to keep the look simple, so I paired them with this adorable black Krisa blouse. It's so flattering and definitely something I will get a ton of wear out of. How cute will it look tucked into a suede skirt with OTK boots? Since the rest of the look was so simple, I decided to edge it up a little with accessories. 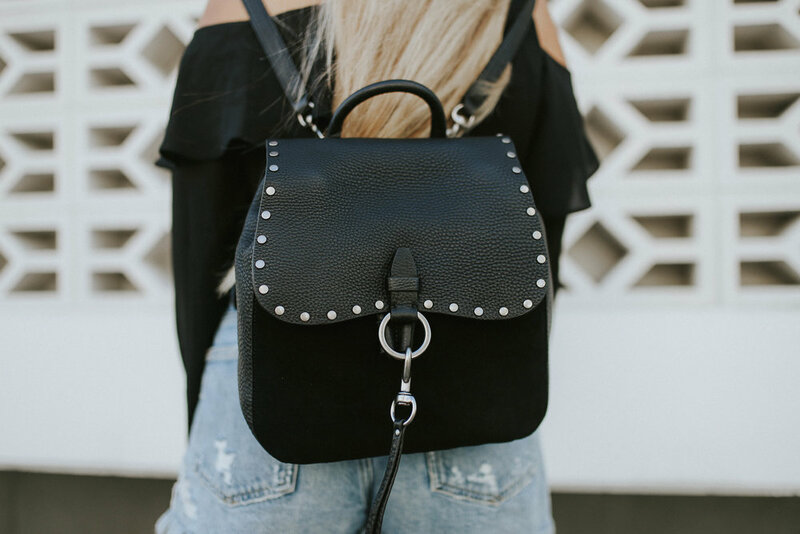 I added this studded belt, these cute ruffle mules and my adorable black backpack. Backpacks are SO in right now and should be in all the time. They carry so much and are so easy to transport. Mine is from Rebecca Minkoff and I love it!